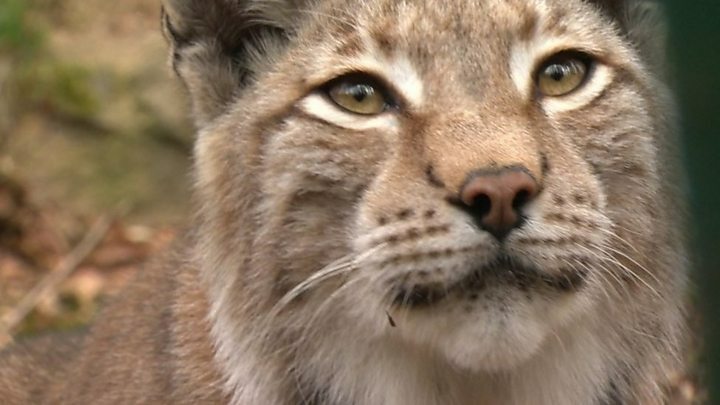 A lynx has escaped from a wildlife park in Ceredigion. The Eurasian lynx, which is about twice the size of a domestic cat, escaped from Borth Wild Animal Kingdom, near Aberystwyth. Police said they have been told the animal went missing some time during the last five days. Park operators said there has never been an attack recorded on people - but warned the public it could retaliate "if cornered or trapped". Staff said the lynx should not be approached if spotted - as it is a wild animal and has sharp teeth and claws. "We have fully-trained keepers on hand to deal with the situation," said a park official. "She is not used to hunting live prey but will chase rabbits and rodents when she gets hungry. "Lynx can travel about 12 miles a day, but the chances are she hasn't gone far. "We will be putting out camera traps around the perimeter of the zoo and relying on sightings by the public. Once we learn her location and follow her trail pattern we can set up monitored traps to catch her." The wild cat is described as being tan and white in colour with dark spots on her back and legs, with a thick, stubby tail which is no more than six inches long. If the animal is seen, people are asked to contact the zoo park directly or the police. Dyfed-Powys Police said the public in the area should be "alert and vigilant". "The lynx is unlikely to approach people, but may attempt to take livestock or pets as food," said a force spokeswoman. "We do however advise that the animal should not be approached as it could become aggressive if cornered. "It is believed that the lynx remains in fairly close proximity to the Animalarium, but of course it could potentially go further afield." Video Will wildcat lynx be reintroduced to the UK?